Today's guest contributor is writer, coach, violinist, filmmaker, law school graduate, and web designer, Emilie Wapnick, who works with multipotentialites to help them build lives and businesses around ALL their interests. She's the author of Renaissance Business and the troublemaker behind Puttylike.com. I'm so glad Emilie chose this topic -- it's the same feeling I had when I quit journalism. I had been a journalist my whole life, but by the time I was a news reporter for the Daily Bruin at UCLA my freshman year I surprisingly found myself feeling miserable by what I thought was my life path. Quitting the newspaper was one of the hardest decisions I had made at that point in my life -- I didn't know who I was if not a journalist. Here's a video of me talking about this decision (2 years ago! ), on why I agree that we should celebrate quitting. When I was sixteen years old, I quit the violin. I'd been playing since I was four (twelve years of classical training), but the last few years had felt forced. I remember feeling profoundly ashamed about losing interest in the violin. 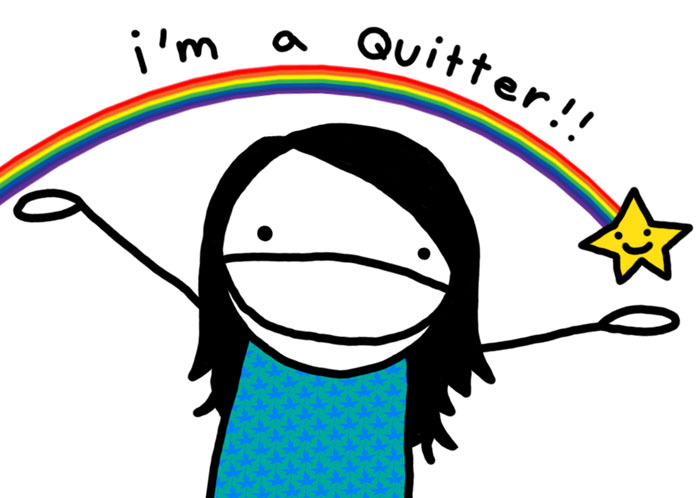 I didn't want other people to think I was a quitter. The label sounded so vile. On a deeper level, I was afraid of letting go of this really integral part of my identity. I was "the violinist." I couldn't remember a time when I hadn't been "the violinist." I finally did quit, and felt tremendous relief. And yet, I feared that in the process, I had traded the label "violinist," for "quitter." As I got older, the haunting feeling that I was simply incapable of committing to one field, only intensified. Was there something wrong with me? A pattern was emerging. Five years later, I lost interest in the guitar, which I had become incredibly serious about. I had also taught myself web design, but had no interest in becoming a full-fledged web designer. In college, I studied film production, and then changed gears entirely and went to law school. Once the end of law school was approaching, I chose not to take the bar exam or apply for law jobs, and nobody understood. "You've already put so much time and effort into it," they pleaded. But my heart was already wrapped up in a new pursuit. Finding your life's purpose is the focus of nearly every personal development book. It's ingrained in our culture, reinforced by teachers, parents, and career counselors. And yet, few of us stop to question it. Are there downsides to being so end-focused? Is it possible that NOT quitting is limiting our potential? Maybe when you get that icky, antsy feeling inside, it's not a sign of self-sabotage or "fear of commitment." Maybe when you feel bored, it's your body's way of telling you that it's time to move on, that you got what you came for. Letting go of an interest allows you to free up room for new projects. It allows you to embrace new passions and keep growing and developing as a full, well-rounded human being. Would I have learned to write songs, build websites, craft a story, produce a film, understand a contract, or grow a company, had I not quit a couple dozen times? I may not have "mastered" any of these paths to their full extent, but I sure as hell picked up a lot of useful skills along the way! If you've read this far, and have found yourself nodding along, then there's a good chance that you're a multipotentialite. While specialists thrive by diving deep into one subject, multipotentialites have many different interests and creative pursuits throughout their lives. As a multipod, you aren't meant to head down one path, but to jump laterally between them, synthesize your knowledge, and draw from your diverse background. In other words, you're meant to be a quitter. It's what allows you to be brilliant. When did we become obsessed with this “one true calling” idea? Well, it turns out that it’s a fairly modern concept. Back in Renaissance times for example, being a multipotentailite (or polymath as it’s also known) was considered the ideal. People were encouraged to become well-versed in many different disciplines: the sciences, athletics, literature, the arts, and so on. It just goes to show, that there is nothing inherent or biological about committing to one field. The idea that changing directions is some sort of deficiency, is a completely socially-based, 20th century notion. It's a very modern idea. So be a quitter, and wear the title proudly. And when you're off designing some innovative architectural structure by drawing inspiration from your past life as a dancer, be thankful that you’ve got the quitting bug in you. We'd love to hear in the comments: How has being a quitter at an important juncture actually enhanced your life?